Carrots are a timeless vegetable. They add heartiness to a mid-winter stew or just the right amount of crunch to a summer salad. Most people think of carrots as long and tapered and of an iconic orange colour. However, carrots can also be colourful and round! Learning how to grow carrots is a relatively simple endeavour; furthermore, they are a fantastic vegetable to grow with children, as they can plant the seeds, pull them out at maturity and start munching. You can buy these Purple Dragon Carrot seeds online at Amazon (click on the image) or try a specialty mail order seed store like Eden Seeds, in Australia. Carrots come in three varieties- round, short and long-rooted. Round-rooted carrots are great for early-season crops. The short-root variety does well if you have shallow soil while the long-rooted variety prefers rich, deep soil. Early harvest types can be harvested before reaching full maturity, giving them a delicate, sweet flavour. The main crop type produces a carrot that is ideal for storage or can work well if you have less than ideal soil. 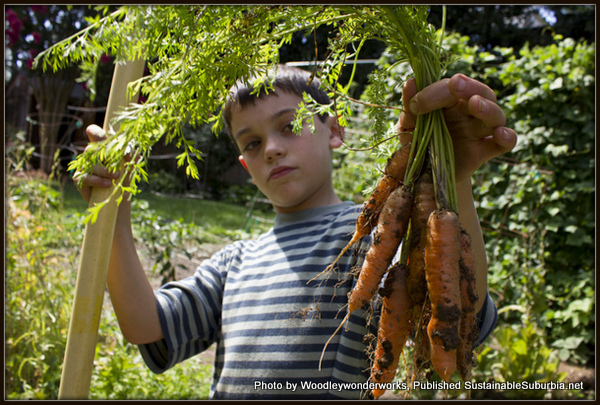 To obtain a truly remarkable carrot crop, healthy soil is the single most important element. Carrots require a light soil that is rich and free from all obstructions like rocks or un-decomposed matter. While carrots are still edible if misshapen, take the time to prepare your bed before planting by turning the soil often, until it has a fine, crumbly texture. If your soil is not ideal for long-rooted varieties, they grow surprisingly well in large pots. Carrots produce best in a sunny location, but main crop types can tolerate light shade. Though I personally have never tested the pH of my soil for growing carrots, it is recommended that the soil have a pH between 6.0 and 6.8. Plan to sow the carrot seeds three weeks prior to the last expected frost. Depending on your desired yield, you can continue to sew seeds every two to three weeks after that, with the last seeds being planted two to three months before the first expected autumn frost. In sub-tropical regions, carrot seeds can be planted out in autumn and winter. Water the soil deeply before planting. Carrot seeds are very small and can be quite fiddly. Direct sow the seeds approximately five millimetres deep in groups of four spaced two centimetres apart. Tip: Sowing the seeds in rows makes it easier come time for thinning. Gently tamp the soil to cover the seeds. The seeds should only just be covered with soil to make it easy for their delicate tops to emerge. Water the area with a gentle spray so as not to wash away all of your hard work. The first seeds should begin to sprout in two to three week’s time. Carrots are a relatively straightforward and easy vegetable to grow; however, they do need to be thinned once the tops reach two centimetres in height. Thin the seedlings to no less than four centimetres apart. Two weeks later, thin again to no less than ten centimetres apart. The thinning process is important to give the carrots room to grow, prevent misshapen vegetables, and to allow for enough nutrients, water and light to reach them. As carrots grow, they push up and out of the soil. Therefore, cover the crowns (where the top meets the carrot) with mulch (like barley straw) or soil to prevent green and bitter crowns. Ensure that the area remains weed-free. The soil should remain evenly moist throughout the growing cycle. If the soil dries out, it is best to re-moisten the bed gradually over a few days. A heavy watering at one time will cause the roots to split. Carrots grow well with shorter root vegetables such as tomatoes, beans, leeks, lettuce, peas, peppers and rosemary. Keep carrots away from dill, celery and parsnips, as they tend to hinder their growth. Carrots can be harvested as soon as they are big enough to eat, or they can be left in the ground to mature for a single harvest. Water the bed before harvesting to soften the soil and make the pulling a bit easier. Pull the carrots up by hand to prevent bruising or breaking. You can loosen the soil gently with a trowel before you begin. Harvesting should take place on a still evening to keep the carrot fly from attacking your crop. Carrots can be stored at an ideal temperature of 0˚C. Store only the best, undamaged carrots by cutting off their tops and placing the roots (so they are not touching) in a dry box between layers of newspaper or sand. Carrot fly is the main threat to your carrot crop. The flies are attracted to the smell of the carrots. They lay their eggs in the plants and the larvae eat through the carrots causing them to rot. Infestations usually occur in the early spring when they are looking to lay their eggs, so delaying planting may help to mitigate the problem. Thin and harvest on a still evening since the flies are dormant in the evening and a lack of wind will prevent the smell of carrots from spreading. The carrot fly is not a good flyer; so if you have a windier area on your property, consider planting there. Otherwise, pots on high balconies are another option to sidestep the pest. This post is included in the Homesteading Link up at Farmer’s Daughter – Click on the button to see all the other great posts too. Well, I’m quite looking forward to trying carrots again after reading all of this helpful advice. Thanks!